In most cultures, Black is a colour that is synonymous with sorrow, grief and bad omen. But for me, it is a colour that is beautiful, stylish and stunning. Black is the only colour with which you can never go wrong. This black sheer saree is borrowed from my MIL and is more than a decade old. She had bought it from her trip to Oman. This remains my favourite saree from her wardrobe. And I just wait for an opportunity to wear it. I kept the styling simple. A simple mangalsutra and silver cuff. You look so elegant Aditi ! at first look it seemed sort of lace pattern, its printed or embroidered ? I love black! You can combine it with so many things,that's why it's perfect! It was an old belief that black is the color of sorrow or grief. But today, it is the most widely weared color specially on occassions and functions. It is a color which suits to all. That saree is looking absolutely fantastic on you. 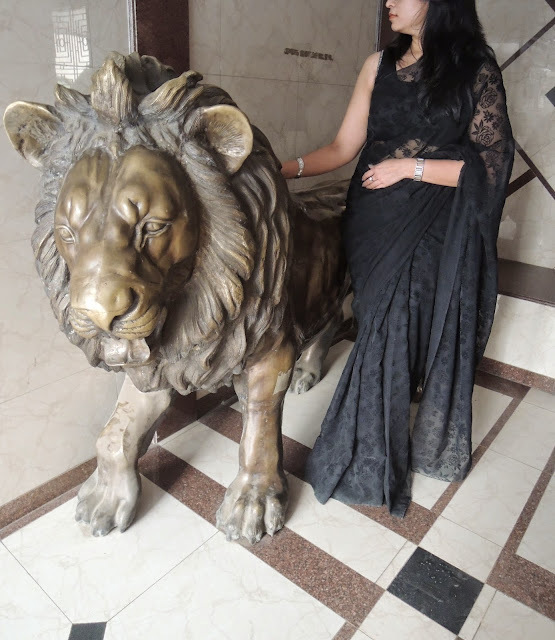 Nice black sheer saree...i loved it. Black, a color that is best defined as a combination of all the shades and none at the same time, has been identified with several natural and supernatural occurrences over the past centuries. At Indian wedding sarees, Fashion in different design and look at reasonable prices.